IMPORTANT INFO: Please note that the Sea and Snow locks have been discontinued and out of stock. All ABUS Granit locks are now weatherproof so the same lock can be Purchased Here but with a black body and also available in two sizes! A fully weatherproof padlocks that is insurance approved to CEN Grade 4. Many marine grade padlocks require a stainless steel shackle but this inherently reduces the security. 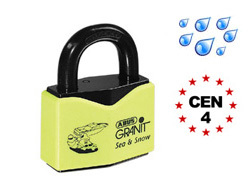 The Sea & Snow padlock retains a hardened steel shackle that is resistant to bolt cutting and saw attacks and a specially formulated layer is applied to the shackle to prevent corrosion. Note that when unlocked the shackle can be removed completely. This padlock also contains the ABUS Plus cylinder offers the highest security with 250,000 key different variations. This padlock is available in a keyed alike sets but they must be ordered especially and can take up to 2 weeks for delivery. Please contact us for more details. Many insurance companies require padlocks which are of a CEN Grade of 4 or higher. 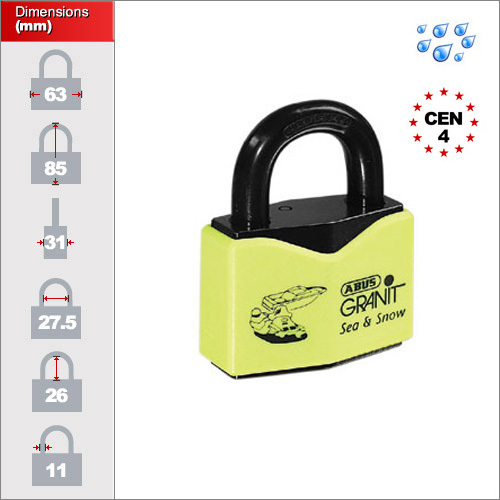 The ABUS Granit range are all grade 4 or higher making them suitable for the highest secutiry requirements.